Get My #1 Best Seller "Find Your Inner Goddess"
You are motivated to finally take action, but you are not sure where or how to begin or what you should do first. I wish I knew what foods were good for my skin. I would like to stop being so negative about my appearance and learn to dress for my real body shape. Jennifer Ettinger talks about her book with Lynnis of Praiseworks on "The Wellness Journey" radio show. If this sounds like you, this is the book for you! If you are on a quest to reclaim the woman you are meant to be, starting with accepting and embracing your physical shape, overflowing to a harmony of body image, mind and spirit, this book is for you! You are just a click away from finding YOUR Inner Goddess! “Jennifer Ettinger has walked on both sides of the fence; she knows depression & desperation, as well as her own divinity and delectable beauty! 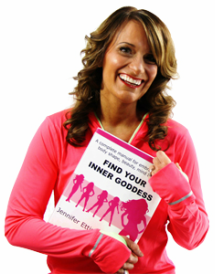 Find Your Inner Goddess is a first-hand account of Jennifer’s unbelievable story, as well as a “how-to-manual” for the rest of us to discover our own magnificence, passion, self-love, and dreams. This book is for every woman: young, old, thin, and full-figured! the best - selling author of Simply...Woman! & Simply ... EMPOWERED! Founder of HealthyGirl & best-selling author of 30 Days to Wealth! "Jennifer Ettinger is such a joy to work with. She is an inspiration to women in York Region and has that special touch when it comes to talking about women's issues, health and wellness. Just speaking with her leaves you feeling refreshed and energized and ready to put your best foot forward." "In Canada's fastest grow-ing magazine, Jennifer Ettinger in every issue of Chloe, brings light and perspective to health, fitness and the empower-ment of women." with a harmony of body, beauty, mind and spirit. Meeting Jennifer was a dream come true! Working with Jennifer gave me a chance to focus on myself and feel fabulous doing so! and wants to see your success-as this is her reward. How can I fail when I have my own personal cheerleader! the instant I met her! I am happy to put myself in Jennifer's capable hands. Jennifer has an innate ability to motivate and encourage! enormous courage throughout her struggle against overwhelming odds. it's doing what's right for each woman's best health, wellness and happiness. It's freedom from body image issues and that unattainable idea of perfection. inspired by Jennifer's degree in museum studies. Copyright © 2009-2016 Fit Your Style®. All Rights Reserved. Website designed by www.mcdesignservices.com.